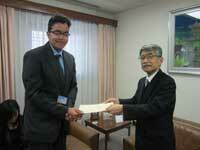 Nepali Students Awarded in International Law Moot Court Competition "Asia Cup 2012"
On February 7, 2013 the award ceremony was held at the Embassy of Japan. 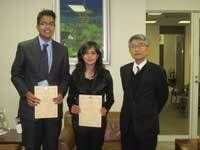 Two students of Kathmandu School of Law, Ms. Sudeshna Thapa and Mr. Sharad Sharma, were presented with awards by the Ambassador of Japan, H.E. Mr. Kunio Takahashi. Ms. Thapa and Mr. Sharma participated in the competition which was held in Tokyo last August as the representatives of Nepal and won third prize of the “Fighting Spirit Award”. The International Law Moot Court Competition “Asia Cup” started in 1992. Students from China, Indonesia, Korea, Nepal, The Philippines, Singapore, Thailand, Vietnam and Japan took part in the competition “Asia Cup 2012”. At the International Law Moot Court Competition, participants perform the role of applicant or respondent at a fictitious law case and compete with their excellence of legal argument following the set procedures similar to that of the International Court of Justice. It is possible for participants to argue on the same basis regardless of their nationalities, because law cases of the International Law Moot Court are treated by not domestic law, but international law, which is considered to be appropriate all over the world.